Come see the latest and greatest in tiny home living trends! Learn about simplifying your life and living greener and local. 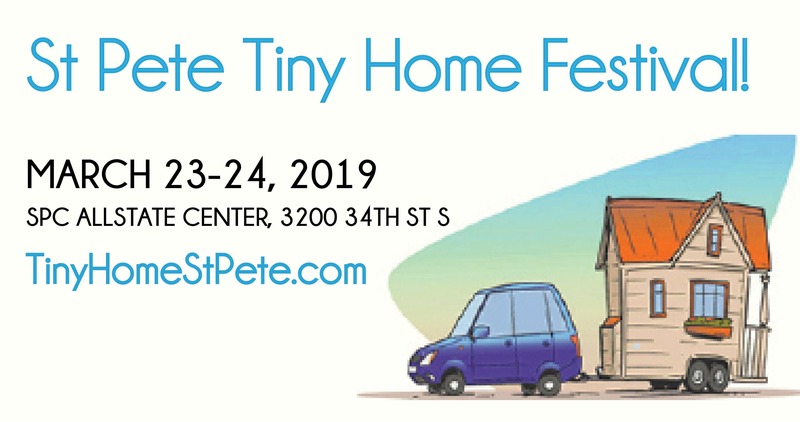 St Pete Tiny Home Festival & Live Local expo will feature tiny homes, micro homes, food trucks, mobile boutiques, artists, vendors, workshops, entertainment, children's activities and much more! The event takes place March 23-24, 2019, from 10am - 6pm, on the campus of SPC's Allstate Center conveniently located off of Interstate 275 on 34th St S, in St. Petersburg. More than 20 Tiny Homes, Skoolies and Converted Vans are coming to town!— 25+ Tiny Homes, Skoolies + Converted Vans! !— 10+ Expert Speakers!— 40+ Artists, Crafters and Small Businesses!— Food Trucks!— Mobile Boutiques! For vendor and sponsorship information email ester@localshops1.com!This event is rain or shine.Please no pets. No Drugs or AlcoholSmoke-Free CampusNo Weapons **Because we are an eco-friendly, Earth-loving community, we ask that our guests and visitors consider taking alternative forms of transportation to this event. We strongly support and encourage ride sharing, arriving on two wheels or by foot. If you absolutely must take a vehicle, please stay tuned for a confirmation e-mail (once your tickets are purchased) on where to park. Please bring personal water bottles, and we will provide cold water.